EasyBums ~ photo & video albums on the go! ON SALE! Easily create photo & video albums on the go. Start organizing your photos/videos today with EasyBums. Access your favorite photos/videos easily and quickly without scrolling through 1000s of them on your camera roll. See the date and location of your photos immediately! Photos in your albums are also automatically categorized by month so you can jump quickly to a time period. 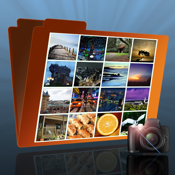 ★ Organize Your Photos & Videos... Create albums right away on your iPhone/iPod Touch. Add multiple photos/videos simultaneously from your camera roll to your albums. Now you can access your favorite photos/videos easily and quickly. ★ View Photo/Video Date & Location... When did your baby first walk? Where is this restaurant with fabulous desserts? Your camera roll doesn't tell you? No worries, EasyBums will automatically tell you when you took the photo, and where you took it! ★ Add Captions... Want to add a little note to the photo? With EasyBums, you can add captions to your photos to help you remember that precious moment. ★ Fast & Compact... EasyBums doesn't keep a copy of the photos/videos you add to or remove from your albums - they are still on your camera roll. Which means your device won't run out of space if you decide to add every photo & video from the camera roll to EasyBums. ★ And Much More... Change a theme, re-order your albums, move photos quickly from one album to another. Full support for retina display on iPhone 4.